Everyone experiments in their teens, but not everybody experiments with making sambuca under their bed at boarding school. But then, not everyone ferments anchovies in their kitchen for fun, either. 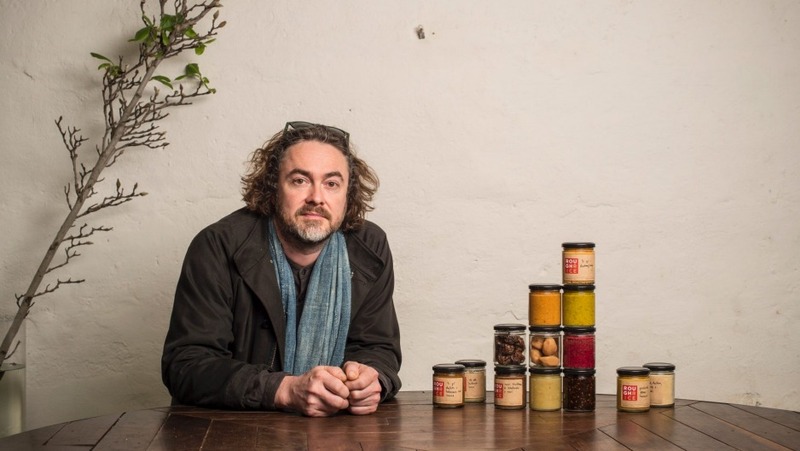 That's what sets Adam James – wild man of Tasmanian ferments – apart from the rest of us. The sambuca was the first taste of fermenting for the founder of Tassie company Rough Rice. "I got busted and would've been expelled but I actually didn't do anything illegal," says James. "How was I to know what would happen by mixing aniseed essence with warm water and sugar?" As we're increasingly health-conscious, fermented foods are something many people are choosing to include in their everyday diets. All in all, it's a good time to be Adam James. He spends his days making ferments and selling them directly from his house to restaurants. "You know, fermentation has been practised all around the world. Places like Japan, Korea, and China really believe in fermentation being a part of their diet because of the health benefits. In Okinawa their life expectancy is 20 years longer than anywhere else, and they put that down to drinking this fermented turmeric tea." Fermentation guru Sandor Katz has been talking about the benefits of gut health for years. "For someone who has been battling with HIV since the 80s, he's possibly one of the healthiest looking people I've ever met," James says. The two met five years ago after a workshop Katz was holding. It was then that James went from ferment-curious to ferment-obsessed. When he was planning to travel the world to study different fermenting techniques, Katz helped him with his itinerary. "He was doing a trip to China at a similar time so he actually shared a lot of contacts he had made over there. He was really helpful in putting together the whole trip." James immediately fell in love with Kyoto and has visited every year since. "It's a rich, traditional food culture, and fermentation has a very integral role within that. I was eating all these amazing pickles in Kyoto – misos and different vinegars. The flavours that they were creating through this all-natural process, I was really amazed." Around the same time, he was running Tricycle Cafe in Hobart with his then-wife. When they first settled in Tasmania, he says it was a cultural void. It was a shock to the system for the pair, who had spent the previous two years travelling around Australia. "That was when I first started working in kitchens. We'd just spent a lot of our time sourcing ingredients wherever we were and then just playing around. We spent a lot of time cooking and learning and reading." I just made up a bunch of meats and they're super active. I've given up on fish sauces - they're really intense. He'd always been interested in food. The son of an Australian diplomat, as a child he lived around the world spending long stints in Chicago and Beijing. "A lot of my memories from China are food-related. Even just the smells of the back alleys." When his parents relocated to Russia, he found himself in Adelaide at boarding school, making that bootleg hooch under his bed. He's up to around 30 crocks now. One of his favourite things to do now is take a glass of wine onto his balcony and listen to all the crocks percolating away. "That's my office, so to speak. I like the smells, you know." Not that everyone would agree about that. "Ah, at the moment the smells are pretty intense. I just made up a bunch of meats and they're super active. I've given up on fish sauces – they're really intense. Actually, my son was just like, 'No. Get rid of it, daddy'." James says there's only been one real disaster, a Sichuan broad bean ferment called doubanjiang. "I'm not entirely sure what went wrong, but it was in a 100-litre crock – it was a massive amount of broad beans. I've been making douban for years but something got in there that shouldn't have been in there and it turned pretty nasty." But James is quick to defend even the failed experiments. "It's a really natural way of adding excellent complexity and layers of flavour. That's what I love about it. It's all natural and it's this alchemy of making something out of something else by time. That's all you're really doing." James loves to challenge himself with using whatever ingredients are on hand at the time. It can be limiting in Tasmania, because that all comes down to what the farmers are growing, and he remains staunchly live and local. "Most of my stuff now is wild ferments using local vegetables. What I do is get individual ingredients, ferment them on their own, and then see where they're at after X amount of time, and then blend them together. I guess in the same kind of vein as a winemaker making a blend. What really excites me is creating flavours that no one else has done before because no one's really doing this kind of thing." He feels that, after five years, he's got a strong handle on what works. Which means he can then apply the Picasso principle of doing what he likes. "I made a miso just last week using borlotti beans. And what goes well with borlotti beans? Rosemary. It's got really Italian flavour profile but it's a miso and that's going to sit there for six months. I mean, I have no idea what it's going to be like but I imagine it's going to be really delicious." Music to cook to: Teebs' album Estara. It's just kind of zen and just puts me in a nice head space. After-midnight snack: Some sort of cheese and pickle toast with hot sauce. I've got like eight different hot sauces. That's where it all started. I started with the fermented chillies thinking Rough Rice is going to be all out hot sauce. But then, I just got really interested in other flavours as well. But hot sauce is a big one. Indispensable kitchen tool: I've got an amazing pestle for bashing vegetables, that a friend made out of all Tasmanian hardwoods. It's probably a metre long with three different types of wood that is kind of hand-shaped. Secret ninja power: Alchemy, I guess. Formative food moment: Meeting Jeong Kwan, the Korean Zen Buddhist nun. She lives up in the hills in a temple called Baekyangsa. She's completely self-taught. She's got a little garden, goes foraging and relies solely on wild fermentation. She's nestled up in this beautiful little spot up in the mountains and has her 60-odd crocks just sitting out on her deck. And the flavours that she's created – I've just never tasted anything like that before.